Home / Precious Metals Investing / Coin Collecting: More Fun with a Friend! Coin Collecting: More Fun with a Friend! All of us feel a need to belong and enjoy similar interests with friends. Coin collecting is no different. If you are a coin enthusiast, you might find that the hobby lends itself to solitude. But it doesn’t have to be! Many people that become interested in coin collecting begin by having their interest sparked when they buy from a national advertiser or the U.S Mint. Some of the most common coins that generate interest to branch out into this hobby are the American Silver Eagle or the Morgan Silver Dollar. Often these types of coins are known as the “gateway” for a person to delve into this hobby. Generally a collector will begin by choosing a series of coin and then attempt to collect one of every mintmark and date. Some people choose to become fully immersed in a certain area of numismatics. For example, they may collect the Sheldon variety of Large cents instead of just collecting by date. A serious collector may try to find an example of every variety of one year. The longer you are involved in coin collecting and the more serious you become, meeting others interested in your same hobby will most likely become important. It is nice to be able to have conversation with others regarding similar interests. Seeking out people that have been involved in the hobby for years can be very interesting and help you to learn more about what you love. There are many different clubs and organizations you can become involved in to help you enjoy the hobby even more! Enjoy your hobby, meet new friends and be proud of what you collect! 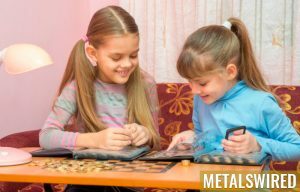 MetalsWired.com: Coin Collecting: More Fun with a Friend!